• For quantitative determination of zinc ion Zn2+ and evaluation of drug effects on zinc metabolism. • Zinc is an essential trace element and plays many key roles in metabolism. It is required for the activity of more than 300 enzymes, the structure of many proteins, and control of genetic expression. Zinc status affects basic processes of cell division, growth, differentiation, development, performance and aging through its requirement for synthesis and repair of DNA, RNA and protein. The common causes of zinc deficiency are low dietary intakes and low bioavailability. Clinical signs of zinc deficiency include acrodermatitis, low immunity, diarrhea, poor healing, stunting, hypogonadism, fetal growth failure, teratology and abortion. Zinc deficiency has now been recognized to be associated with many diseases such as malabsorption syndrome, chronic liver disease, chronic renal disease, sickle cell disease, diabetes, malignancy, and other chronic illnesses. Simple, direct and automation-ready procedures for measuring zinc concentration in biological samples are highly desirable in Research and Drug Discovery. BioAssay Systems zinc assay kit is designed to measure zinc directly in biological samples without any pretreatment. The present method utilizes a chromogen that forms a colored complex specifically with zinc. The intensity of the color, measured at 425 nm, is directly proportional to the zinc concentration in the sample. 1. Our plate reader does not have a filter for 425 nm, can I use 405nm or 450 nm instead? 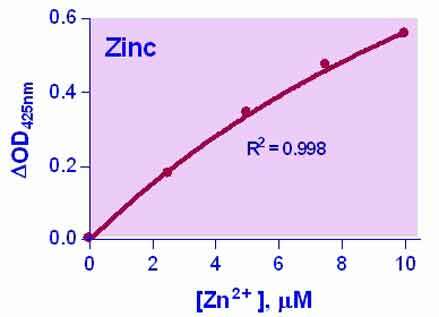 No, the zinc assay must be measured between 419 nm and 426 nm. Outside of this narrow range the assay will not work. 2. How many standards (to generate a graph) should I include in the assay? Because this assay is not linear from 0.12 to 10 µM, please follow the protocol and run standard curve for each assay. 3. Do I need to dilute urine samples for this assay? No, the zinc concentration in urine is sufficiently low.